Today is my friend and fellow beer writer Lew Bryson’s 60th birthday — The Big 6-O. You used to be able read his writings at his website, lewbryson.com, Seen Through a Glass, and his Session Beer Project, and for a while there was less there because he became the managing editor of Whiskey Advocate and wasn’t writing about beer, although he’s still kept up with his political Why the PLCB Should Be Abolished. His latest book is also about Tasting Whiskey. But he’s back, baby, and is once again also writing about beer at his websites and other places. Lew is my favorite big galoot and the brother I never had. Join me is raising a glass of beer or whiskey and wishing Lew a very happy birthday. 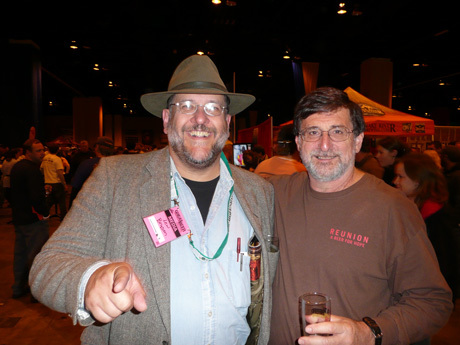 Award-winning beer writer Lew with Pete Slosberg at GABF several years ago. 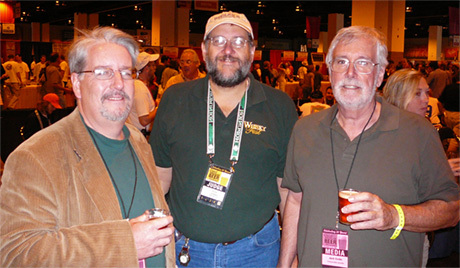 Lew and Rick Lyke at the World Beer Festival in Durham in 2008. Birthday boy Lew (middle) flanked by fellow Pennsylvanians Don Russell (a.k.a. Joe Sixpack) and Jack Curtin. I’m originally from Pennsylvania, too. What is it about the Commonwealth and beer writers? Me and Lew at Triple Rock a few years ago. >What is it about the Commonwealth and beer writers? Ah…never knew Lew was a fellow aquarius. Explains his brilliance with all things beer. Happy Belated Birthday (former) BIG guy! Aw, shucks. Thanks, Jay, ya big galoot. I had a great day: wife and both kids had work called off for the storm, so we just lazed about in the morning. Later I shoveled three inches of sleet off the sidewalk and driveway, then celebrated by driving into town for a Rogue Strong Ale at Isaac Newton’s. Then I came home and pretended I’d just been to the P.O., and had a Stegmaier Bock…mmmm. The we all went down to the Grey Lodge in Philly for dinner: Flying Bison Herc C-130 Strong Ale (biggest FB beer I’ve ever had, nice stuff) and a Flying Fish Love Fish in honor of the day I share my birthday with. Came home, hung with the family, then capped things off with a measure of Weller Antique bourbon. 48 feels GOOD! And good idea, cutting off Jack’s comment. You never know what’s going to come out of him. I just started reading Lew’s blog recently and have subscribed to it on my Google Reader. Helps me get through the long days at work. Happy birthday Lew from the other side of PA and fellow Feb (21st)birthday beer guy! Well, I join everyone else in wishing L.B. a happy “swiftly approaching 50” birthday. For the record, it’s not about the Commonwealth and beer writers, it’s simply about the Commonwealth and beer! With the richest brewing history of the original 13 colonies, let alone the 50 states (and currently a helluva lineup of micros and brewpubs), we’re bound to have the best damn beer writers this side of the pond! God bless ya all! Happy Birthday from your friends at the Touch of Asia Spa. What’s weird is, far as I know, I didn’t post a comment. Or try to. What a young guy you are! Happy Birthday! I always enjoy following your writing and wish you years of liquid pleasure to come. Damn. I was enjoying myself too much to notice! 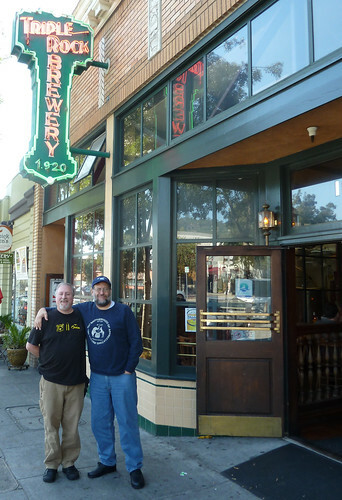 Cheers, Jay, Greg: good time that afternoon in Berkeley/Oakland, Jay, much thanks for showing us around! Happy Bday Lew!!!! Not sure if you remember us from Ohio Brew Week a couple of years ago but we shared some good beers and fun times. Cheers! Hope you have a beery good day! Happy birthday you old phart! Old enough to know better, too stupid to stop…. From an older phart! 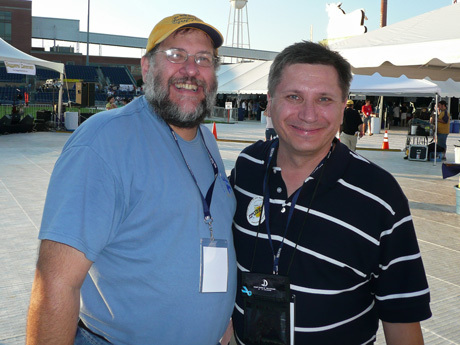 Sure had fun with you at Ohio Brew Week a few years ago,good times! Hope you’re having a hoppy beerday!